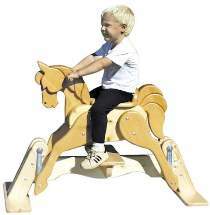 This rocking horse uses ball bearing glider brackets to provide ultra smooth back and forth motion. This design is far sturdier and much safer for children than old-fashioned rockers. Layered design means easy construction and assembly. Sturdy enough to last for many generations. Includes a safety step so even young children can climb on and off. Measures 33"H x 36"L x 20"W. Patterns for all pieces drawn FULL SIZE. Special offer includes the #W2330 Plan, glider brackets and birch handle.